Another, much lesser known, part of the Reed mythology is the episode four seasons earlier when he fought practically the entire Lakers team. Part of the reason it is little known is because whatever footage of the fight that exists was rarely shown to the public, until now. Michael Rapaport's 30 for 30 doc When the Garden Was Eden (based on Harvey Araton's book of the same name, which focuses on the 1970s Knicks) debuted on ESPN tonight, and it showed the fight many have been waiting to see for decades. "REED AND LARUSSO EVICTED FOR FIGHT" blared the headline of Dave Anderson's October 19, 1966 game story in the New York Times. "Imhoff Flattened, Block Gets Bloody Nose—15,755 See Bellamy Pace Victory," read the subhead. Reed and Lakers power forward Rudy LaRusso had been scrapping all game, but things finally reached a tipping point in the third quarter. The two lined up next to each other on the foul line, and while jockeying for position on the ensuing free throw, LaRusso claims Reed threw an elbow at his head. LaRusso responded to this provocation with an attempted haymaker, and all hell broke loose. Reed and LaRusso found themselves in front of the Lakers bench, which sprung onto the court in LaRusso's defense. In the confusion Reed flattened [Darrell] Imhoff, a 6-foot-10-inch, 220-pound center, with a punch over the left eye. [John] Block, a 6-9, 210-pound rookie center, suffered a bloody nose, which turned out to have been fractured. Imhoff, holding a bloodied towel to his face, lay sprawled in front of the Laker bench for several minutes while the police restored order among a few of the 15,755 spectators who had run onto the court for a ringside view. Imhoff needed one stitch to close a cut on his left eyelid. LaRusso, who is 6-8 and weighs 225, later admitted that "Reed hit me a couple good ones." Both were ejected from the game. According to Bill Gutman's Tales from the 1969-70 New York Knicks, afterwards Reed warned his teammates to never restrain him if he were in a fight. Apparently Reed had been hit with a bottle while in college because a teammate was restraining him, and he essentially told them they were liable to be decked if they tried it again. The Knicks ended up winning the game 122–119 (you can check out the box score at Basketball Reference), but who cares really? 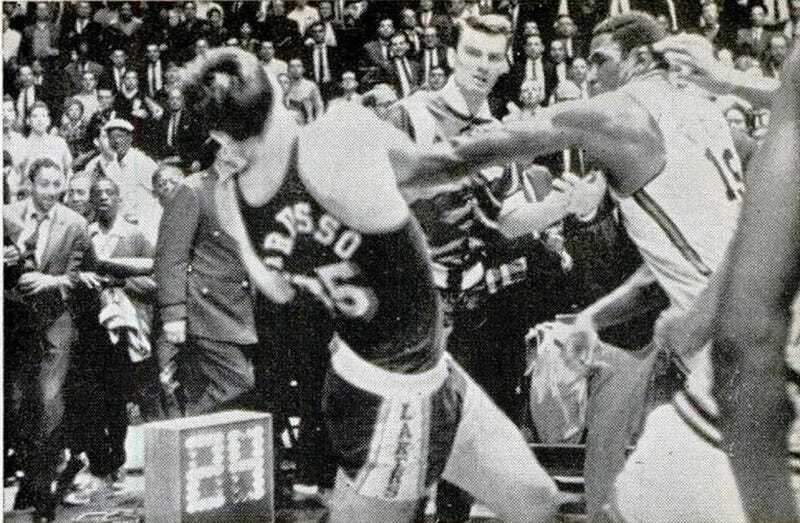 In 1966 the NBA didn't take fights particular seriously—we were still 11 years away from Kermit Washington almost killing Rudy Tomjonavich with a punch—so neither Reed or LaRusso were suspended, merely fined $50.